This is a repost from Hearthpwn. Go upvote me! Sadly, you’ll have to follow the Hearthpwn link to see the decklist. This PC has neither Hearthstone nor the ever-handy SnipTool to bail me out! This season, control warrior has been great to me. It absolutely dominates the aggro Paladin deck that’s become a thing lately, is favored against any Hunter or Rogue, has fair matchups against any Mage, Druid, or Shaman, and is only OK against Warrior and Warlock. Yes, that was a little generalized. C’est la vie. The Grand Tournament is releasing in the middle of the season, and here I sit at Rank 7 or 8(honestly, I don’t recall which right now), wondering if I should crack all those delicious pre-ordered boosters and start brewing, or stick with the old standby and try for legend. TGT brings a few cards that could slot right into a traditional control build. However, I don’t think King Varian Wrynn is one of them. Sure, its an amazing card, and I may be as wrong about Wrynn as most people were about Dr. Balanced, but hey, its my call to make for now. Control warrior’s minions all serve a very specific purpose, and some of those purposes only come to fruition through battlecries. For example, Ysera is there to grind opponents out from a more or less even board, and Dr. Boom comes out to stabilize a board that is only somewhat behind. Sure, its great to play Varian and put Alexstraza into play, but really you just played a few large dudes, and warrior is RARELY far enough ahead that its OK to just do that on a turn and call it a day. 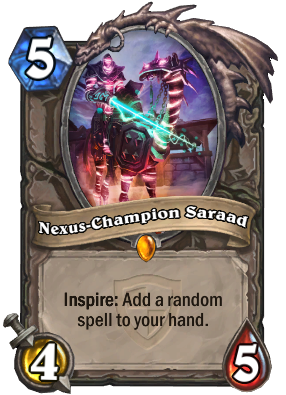 Anyway, there are two legendaries that caught my eye from TGT: Justicar Trueheart and Nexus-Champion Saraad. Both help push the game into longer, grindier territory, where warrior shines. I admit, I’m not sold on Saraad yet. The reason control warrior is good is because there are so few RNG effects. Boom Bots, (formerly) Sylvanas, Ysera, and Brawl are the only unknown variables, and those all have good-to-insane outcomes. Reducing the RNG would be ideal, but I don’t see a better option than Saraad to replace Ragnaros, who has one too many times purged the wrong target for me to do anything but wince whenever I hear “DIE, INSECT!” Ragnaros is “just” damage, while the Nexus-Champion can provide somewhat controllable value over a series of turns, and I believe he is worth trying out because of the blowout potential of an unexpected spell. 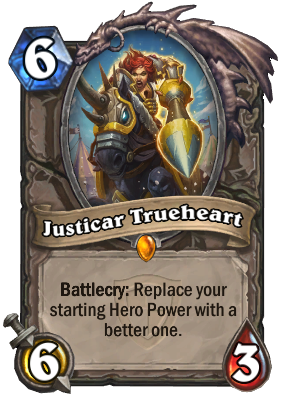 Justicar Trueheart is far more straight forward. You play him and lose board position from him having three health, but the payoff of extra armor is big and becomes HUGE over a longer game. You won’t have to sit on Shield Blocks or Shieldmaidens in case you draw Shield Slam and need to remove a large target. Despite falling behind on board when you play him, he seems like an obvious inclusion. The only other change I plan to make between my current build and post-TGT is probably +1 Random Threat in place of -1 Alexstraza, though again, I may miss the big dumb dragon. Alex usually served as a way to pressure an opponent that had lots of healing with a small window to kill them with Grommash. This was needed because there just weren’t many real threats in the deck, but now, warrior has the potential to just run another deck right out of threats, and with the focus being heavily on valuing out someone rather than just trying to steer the game into a winning Grommash turn, Neferian or even Chromaggus could be pretty good. I suppose we’ll find out just how right or wrong I am tomorrow morning!